The Ontario Knife MK3 Navy knife is the current military issue knife to the U.S. Navy. Situated in New York State's scenic Southern Tier, Ontario Knife Company produces one of the most comprehensive, wide-ranging product lines in the cutlery industry today. While being a worldwide supplier, the Ontario Knife Company is also a major supplier to the U.S. Government and its military. Ontario has built its reputation on a heritage of uncompromising craftsmanship, quality materials and components, and a steadfast commitment to its workforce. Black oxide finished stainless steel blade. 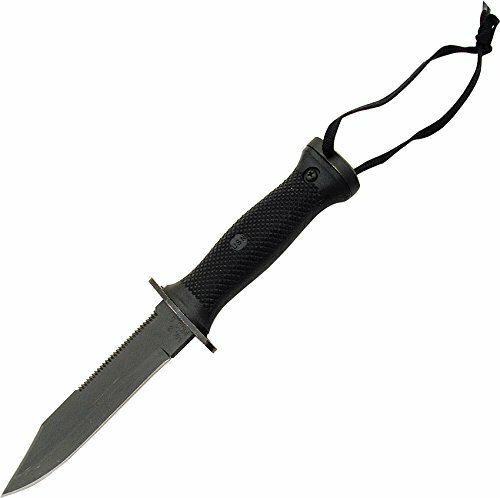 Molded high impact black plastic handle. Includes molded plastic sheath. Blade has a hardness of 49-54 HRC. Sheath is equipped with a brass belt hanger and loop. Note: These knives come with an application of oil to protect the finish of the blade during storage and transport. Once that oil protectant is removed with a cloth, the knife looks good.